Before starting the season, and even before playing any games, a hockey team has to practice a lot. They practice goal shots; they practice passing; they practice just skating on the ice. But, the one key thing to practice is actually playing the game. Every sports team plays at least one game before the start of season, an exhibition game. And the JLPT is much like a sports game. It’s virtually a Japanese language Olympics if you like that analogy. So, it’s important to at least run through the events or sections of the test at least once before the real thing. Otherwise you might end up getting lost somewhere along the way. Some might want to take the ‘natural’ approach of just going into the test or find it silly to walk through it all before you go in. However, the stakes are a bit high for that. The test is only twice a year or if you are outside of Asia only once a year. So, if you fail you’ve got to wait a full year to take it again. Why not spend the extra time to make sure you are ready to go for the main event? This article is about the JLPT N5 test, but if you are studying any other level of the exam, I have a JLPT N4 Practice Test, JLPT N3 Practice Test, JLPT N2 Practice Test, and JLPT N1 Practice Test available, too. As you can see the Kanji and Vocabulary section is largely untouched. However the listening and grammar sections are fairly different. The past tests are still good practice, but keep in mind how they differ from the new test. to open the notes I made. If you’d like to download the ‘clean’ version, you can pick that up here. This is the listening for the test in mp3 format. Unfortunately, the audio only includes the first question of every section along with the instructions, but the script has all the questions go figure. Anyway, if you’d like to save it to your computer and play it from there, be sure to right click and select ‘save link as…’ or something similar. There is also a listening script to help you after the test. This is the authentic answer sheet for the sample test, so you can practice your circle-filling-in skills. Be sure to use a No 2 pencil! The answers to all those questions, so you can check your results. I went ahead and converted the first 12 questions into flashcards for Anki. I haven’t gotten around to making them available for Mnemosyne yet, but I’ll try to get those up soon. In the meantime, you can use these to review the questions or add them to your personal study deck. They are also available on AnkiWeb, so you can search for them (“N5 Practice Test Questions”) and download them that way. The sample test is bit shorter than the real test, so I worked out a new schedule that should match the speed at which you should take the different sections. If you time yourself, you’ll get a good feel for how fast you need to complete each section. I recommend getting some kind of stopwatch (or your cellphone) and time out each section so you get a good feel for how fast you need to take the test. I’ve just recently taken this whole practice test and made it available online for you to take, complete with stopwatches to help you time out each section and instant feedback for all the sections. To take it just requires a painless 30 second registration so you can keep track of your progress. Take the JLPT N5 Practice Test online now. It is still a little rusty, so please leave me feedback in the comment sections for each quiz. Thanks and enjoy! 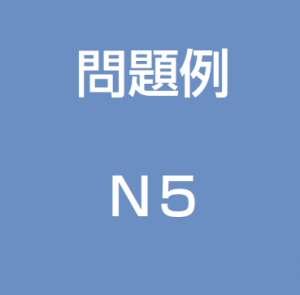 JEES has also just recently made the official JLPT N5 Workbook available for download free. The N5 workbook is pretty close to the same size as the real test and the questions are made up of questions from previous exams. Also it is free, so if you have the time, be sure to download it and give it a try. A subscription to the JLPT Boot Camp Premium site includes a complete guide to studying and preparing for the JLPT as well as a complete grammar guide for N5. The grammar guide includes tips and common mistakes to look out for when taking the test. Each chapter includes a video explanation, clear grammar explanations, several example sentences, and JLPT-style questions. Sign up today and get started on the right path. This is a great book of 500 problems that tests you over kanji, vocabulary, and grammar for N5 and N4. What I like about it is that you answer 3 questions and then flip the page and see how you did with detailed feedback about each question. It is really helpful to check what you are missing. Japanese Pod 101 has a 6 lesson last minute prep course for the test as well as additional practice tests. Also, their lessons are sorted by grammar points, so if you are having problems with a particular point, it is a great place to focus in on the one point that is giving you some trouble. Take the JLPT N5 Sample Test. How was it? What was the most difficult part? This is great, thank you very much for all the hard work you put into the site. Everything has been such a big help to me. I’m taking the N5 exam for the first time in two weeks and seeing my revision pay off with sample tests like this really helps my confidence. I got full marks for the first section, two wrong in the second section (very silly mistakes)and one wrong in the listening section. However I did miss a few in the listening as only half of the questions were in the audio file I downloaded, so I had to quickly open the script and answer in the quickest time possible. I did find the time frame for the listening section of these sample questions a bit short as even with half of the audio being available, the 5 minutes was up. It may be a silly question, but will the listening questions be played off a CD in the exam, or will someone be reading out loud? I wasn’t sure what to expect. Once again many thanks for all your hard work, I will be following the site and the podcasts all the way to N1 when I eventually get there! The time frame in the listening section can fly by really quickly. I don’t know how many times I’ve been thinking about the answer to a question and the next question has already started. It’s like a race. The listening section is played from a CD at the testing center. Sometimes this is done over a PA system, but recently I’ve seen them playing the listening section from a small CD player. They will go through a bit of hearing test to start off and ask you if you can hear it properly though. Make sure that it is nice and loud. You need to think about the fact that people will be coughing, shuffling papers, and writing stuff down which might distract you if the CD is a little too low, so don’t hesitate to raise your hand and get them to turn it up. How much of each part of the practice exam do I need to get right to have a good chance at passing? It’s hard to say since the practice test is so short. It’s meant more for getting used to the exam than checking your level, but if you score 75% overall you should be okay for the real test. Thank you for posting this page! I am going for the N5 exam in two weeks and have been practicing with many of the old 4 level exams lately. I was not aware that some of the formatting had changed, so that finding out about it from you has helped me not to be surprised on the day of the exam! From the practice, I have the feeling that the N5 is actually easier than the old 4. Good luck on N5! Be sure to tell me about how you did! Thanks for the practice test. gonna be taking N5 in a couple of weeks. out of the 29 questions, got 3 wrong. 1 in the 1st section, 2 in the 2nd, 1 in the listening. It will be a big help. Thanks again! Thank you so much for this link! My friends and I are using this as a basis for our JLPT this sunday! Anyway, otherwise, thank you thank you so much for this! Yeah, they only have one of each type of listening question on these freebie practice tests. You have to part with some yen to get a mock test that has the full question count. It’s a little late now, but you could pick one up at a major bookstore if you are in Japan or get at White Rabbit Press if you are abroad, but I’m afraid it won’t get to you in time now. Anyway, don’t sweat it. You’ll do great! Relax and have fun! Thanks for posting the samples. I took the sample test and got three wrong. I will not be able to take the N5 until December of 2012 here in the states and I feel at my level now, by then the N5 will not be a challenge. So I guess the question is If I really continue to study for the whole year, in your opinon should I study for the N4 or N3? If it were me, I would go for the N4, just because N4 grammar is incredibly useful. It is what people use on a daily basis in conversation and it is important to make sure you have a strong foundation in that. So, I would make sure your grammar is solid, but keep studying vocabulary. You can go start studying up to N3 vocabulary and kanji so that you are ready. N5 and N4 grammar is lot of nuts and bolts of the language. Crucial stuff you really need to express ideas. N3, N2 is more phrases, nuances, and written language that is necessary to be fluent, but not essential to communicate with someone. If you are looking to use Japanese a lot, you’ll be using the N4/N5 stuff all the time, so it is important to iron out any issues before moving up. But, that’s just my opinion. Are you strong in grammar? OK, sounds great. My grammar does need to be worked on. I just signed up for the japanesepod101 free account and I think I’ll get the Fast-Track JLPT N4 Practice Exercises (Tanki Master) book to start getting ready. Thanks for your input and I hope things keep going well for you and this site. I think for the N5 test they just assume you don’t know any kanji for all of the sections of the test but the kanji section, so most of the test is in hiragana or has furigana above the kanji that is used. Don’t worry too much about N5, if you studied and reviewed the grammar/vocabulary you should be okay. Did you take a practice test? That will really help you get a feel for how difficult the test is and also how much time it takes. is there any source for N5 mock tests ? websites on JLPT has recommended about 103 kanjis. Do we need to memorize these kanjis or all kanji s will be with hiragana or katakana above the kanji??? Thank you for the response Mac. Can you please provide some links to find out N5 or N4(old) listening audios other than the sample test for N5. i wasted hours finding them, but couldn’t find any. I’m not sure if this is what you are looking for, but you can pick up the official practice book that has as much material as the real test. That would have some good listening examples. I am looking for free downloads,, is there any freely downloadable links for N5 listening?? Hi, I’m from Germany, Hamburg. Hamburg University is one of the places here in germany where you can take the jlpt (Lucky me!) and we only have the 1.7 as testing date. I want to go for it next year so I have one year to study. I’m only 15 so I have lots of time and I’m a fast learner, especially languages. I did the practice exercises for N5 and got them all right in a short time and would’ve probably even passed N4. What do you think, what level can I reach in one year? Should I go for N1 and see where I am next year when it’s time to decide? Or won’t I get that far, should I only try to focus on N3 Or maybe N2? I’d say to focus on N2 for the most part. That seems to be a pretty big boundary for a lot of people. Mostly because you have to have pretty good reading and listening skills to get past that level. N1 is ‘easy’ in the sense that it is just some more phrases, grammar, and a ton of vocabulary, but I felt (and a lot of others do too) that it is pretty difficult to get your reading speed up to where you need to be to read everything in time. But, it is helpful to take the tests along the way. You might want to try to go for the N4 this year and pass and then see what your weaknesses are as well as just get a feel for the test. Im don’t think I’ll have problems with the testing itself like not enough time or not being able to concentrate for I’m a student and I have taken pretty long tests before, sometimes even over 6 hours with breaks and everything. I should be prepared for that. I want to go to Japan to study after finishing school here in Germany and I have to calculate my time til then. I’m in 9th grade now and will be in 10th grade when taking the JLPT the first time. The two years after that I’ll be busy with school and I might only get one more try in 11th grade. So if I take N4 now and I want to have N1 before leaving, I’ll have to jump from N4 to N1 during a very busy time in school. Now I’m free and have time and motivation to study. I think I’ll try to go as far as I can and see what I’m at in January. If I still feel unsure with taking N2 then I won’t go for N1 but if I think I’ll be fine with N1 I’ll try. It’s still a year after all. Thanks for your help. I’m sure you passed N1! I don’t think so, everything is still printed, just these free practice tests. Sorry. I started with the Japanese Level 5 course last month and I think I am catching up fast. I am targeting Level 4 exams in July’ 13. By any chance do you think I will be able to complete Level 3 too by then? How much time does it take to master Level 3? Can it be done in 6 months, or will it take 1 year? Different people are giving me different answers. One even said Level 3 takes 2 years…That some how is a bit too much for me, coz I don’t want to be stuck with one level for so long And again after that how much time does it take to master level 2? Your website is really helpful! I have downloaded the practice tests. Thank you so much! It really all comes down to how much you study and how efficiently you study as well. I have been practicing for N5 since 6 months i hope tomorrow will be fine (fingers crossed) please wish me luck!! I hope you did well on the test today! Let me know how you did. Cool website for noobs like me!!! For the N5 level? There is also the official N5 practice book that might be of help. Please advice me to find another past papers foe JLPT N5 Teaxt. I have already gotten only 2 papers by using this site. I need more papers with answers. There are only 2 official ones available, the practice test, and the practice workbook. Sorry. There are some other mock tests though. Can I know the Web site for mock teasts? I am currently preparing for the n5. This is the best place I find to prepare for jlpt. Your​ posts and videos have helped me lot in improving my Japanese. I saw that in one if your comments you metioned that the kanji and the vocabulary section dosen’t have furigana. Well for the kanji section it should be that way. But since even the vocabulary of the n5 uses higher kanji so how are wo supposed to know that..? All the kanji in the other sections of the exam have ruby or furigana on top of them to help you read. In the vocabulary section, everything is written in kana except in the first two sections where you have to choose the correct kanji or reading. In n5 only internet based test with multiple choice based ? Any reading or voice based test there for n5 level? I only have an internet based version, but the real version is paper. The N5 does have a reading part of it, but there is currently no N5 speaking test. Just a heads up, on the practice test listening mp3 file, some of the questions are skipped. Specifically もんだい２ ２ばん and もんだい３ １ばん audios are skipped and do not play. Yeah, for some unexplained random reason, the Japan foundation left these out of the audio. I’m not sure why, but they don’t exist on the official site either. Next post: JLPT BC 30 | One month to go, Time to Cram?